Web 2.0 revolutionized the means at our disposal to filter and share information. Whether by managing information by social bookmarking or RSS reads and feeds, or communicating with our school community via blogs, wikis, podcasts, YouTube, or Facebook, students, teachers and school librarians have entered into digital conversations. Widgets, portals, Apps, Feeds and Aggregators and more now provide us with our ‘tools of trade’ for information curation. The importance of the teacher librarian is intrinsically linked to effective and responsive information curation and dissemination in distributed environments within and beyond the school. Use of Web 2.0 tools has become embedded in good practice, and information curation has extended beyond the library catalogue to library and school information management systems for bibliographic and media resources, and various organizational tools that reside beyond the school in web environments, such as Libguides, Diigo, Live Binders, wiki, Delicious, Google tools, RSS, media tools, netvibes, iGoogle, and many more. But when a technology focus subverts students’ conversation and development of critical thinking skills (and their ability to evaluate and analyze the information at hand), the mental processes that change knowledge from information to concept are not learned (Bomar, 2010). With the maturation of Web 2.0 tools the importance of nurturing information literacy skills and strategies has shifted to become a meta-literate approach to engagement with information. These tools have allowed us to re-frame information collection as highly flexible and collaborative information and knowledge conversations, while also facilitating information organization. Technology and online integration can facilitate critical thinking and knowledgeable actions, rather than merely permitting the access and transformation of information as part of the information literacy skills set. The point is to engage our students in multiple conversations and research pathways that reflect the changing nature of scholarship in multimodal environments. As Lankes (2011) explains, at last we have a departure from information, access and artifacts as the focus. In the lens of conversation, artifacts and digital access are only useful in that they are used to build knowledge through active learning. Information curation of personal and distributed knowledge. 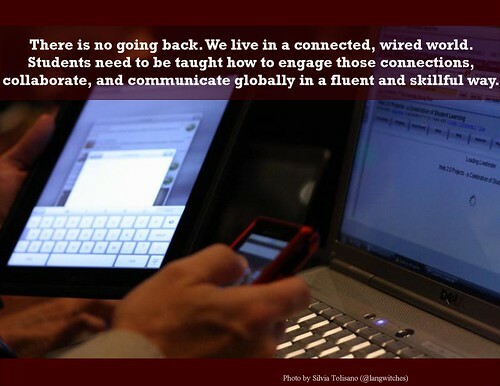 Be sure you are understand online learning environments and the extra-ordinary potential of the social-media mind. Be sure you are involved with and present new ways and new information strategies to your teachers when working within the curriculum and the full knowledge dimension of learning. Be sure you bring with you a full understanding of information literacy and information fluency as the underpinning of all that you do. Bomar, S. (2010). A School-Wide Instructional Framework for Evaluating Sources.Knowledge Quest, 38(3), 72-75. Lankes, D.R. (2011). The Atlas of New Librarianship. Massachusetts Institute of Technology. 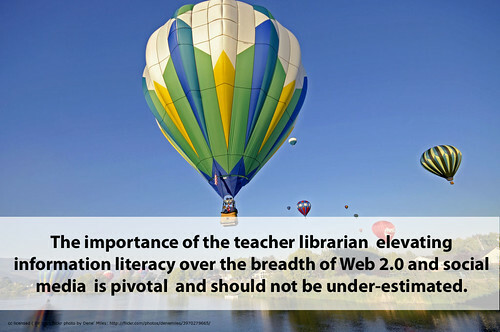 This entry was posted in Curation, Information fluency, Information Literacy, Library 2.0 and tagged Critical thinking, Library 2.0, Web 2.0 by Judy O'Connell. Bookmark the permalink.